A wonderful journey to London and Switzerland in November 2005 gave me an opportunity to visit students and friends in London, Basel, Bern, Maur, Ebmatingen, Zurich, Lugano and Locarno. Rev Christy Ugwuegbu hosted a series of seminars in London England from November 4 through November 7. An all-day program was held at the Newham University Hospital with discussions one-on-one for three hours followed by an intensive seminar with the theme: The Role of the Hospital in Spiritual Healing. A meeting was held with hospital personnel and officials including: Dr Kula Ranjan, Orthopedic Surgeon Dr Borhra, General Manager Lorrian Foster and Director Penelopy Haile. Two days of Living in the Now seminars and discussions were held in London’s Grays and Forest Gate hosted by Rev Christy and UNI student Rev Chioma Agogbua and her son Ebube. Supportive help was given by Ngozi, sister of Christy and Dr Sybil Agogbua of Nigeria. To enthusiastic Swiss audiences I gave some fabulous seminars all translated by Dr Stefan Strässle in his magical manner. An evening seminar at the home of Rev Rösli In-Albon in Bern with the theme: I Am Always In Charge Of My Thought. November 8 in the Bern Vetter Penthouse nine one-hour topics were wrapped up in these themes: Reveal Your Inner, Unlimited Self Through Onepointed Thin-king, Enjoy An Exciting Inner Journey, My Real Adventure, The Revelation Of My True Spiritual Potential, Experience A Life Full Of Self Respect, Love, Inner Peace, Creative Power Of Imagination, Abundance And Spiri-tual And Physical Health. This event was sponsored by UNI student Edith Strebel. 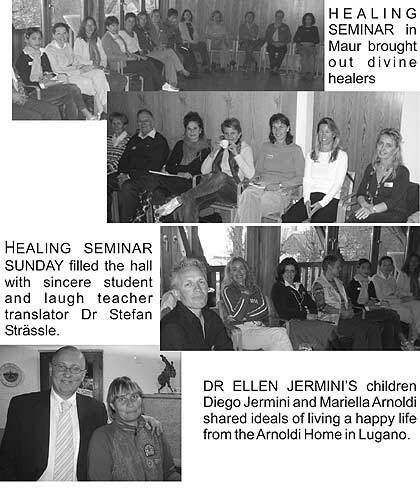 Rev Dr Monica Egli of Basel hosted an Intensive Spiritual Illumination seminar highlighted by a visit to frequent seminar participant for many years, 97-year-old Eleanor Meyer-Bessant who was enchanted by the healing presence of Dr Egli. Dr Egli taught Eleanor how to laugh until she felt her stomach which she had not known for months. Eleanor is the mother of UNI student Rev. Adrian Meyer-Bessant. In Maur-Zurich Restaurant Schifflände on the lake Greifensee was held a two-day seminar November 12-13. Saturday heard the six-hour theme Children and Parents. The events were sponsored by Rev Dr Strässle. Sunday featured a six-hour lecture series on Healing. Dr Strässle taught the group all about the healing balm of laughter. Rev Dr Irene Merkle backed up Dr Strässle as translator. Rev Herbert Marty was a super supportive example for the seminar topics. Ideas were shared on a Child Is Born, Where Does A Child Come From And Why To Our Family. What A Parent Brings To A Child, A Parent Can Make A New Direction Anytime And A Parent Is A Child. Healing Sunday was redefined by 13-year-old Jerôme Suter in how he does whatever the moment calls for as a happy expression - living wholeness every moment. Mini seminars were held in Ticino with UNI student Rev Daniela Ferrari; in Lugano with Mariella Arnoldi, Diego Jermini; and in Jona with Rev Dr Christina Nussbaum. Several evening meetings were held at the home of our Swiss European Bureau Director Rev Gertrud Suter, my home in Switzerland. Dean Dr Herbert L Beierle presents Lydia Hunziker and Rev Gertrud Suter, both from Switzerland with their Certificate of Participation in the 2005 School of the Master training program.